IceFrog has released DotA Allstars 6.63. It has many new experimental things and additions. 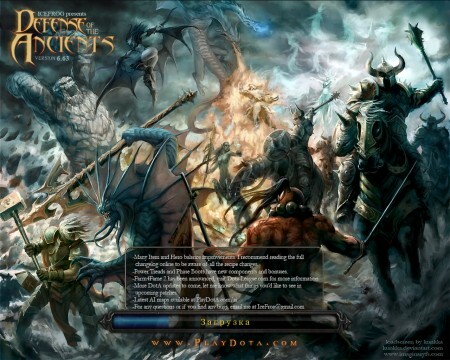 Also we can watch new fancy DotA loading screen, but I believe Knight must have sword instead of that club :) Have fun with new DotA Allstars version. - Curse of the Silent damage/burn reduced from 50/25 hp/mp to 20/10, 30/15, 40/20 and 50/25. - Now requires a sobi mask instead of a Robe of the Magi (100% Mana regen -> 125%, 16 Int->10 Int, 125 cheaper recipe). - Recipe uses Headdress of Rejuvenation instead of Buckler. Loses armor bonus. cant w8 for it to be realese!!! HoN (Heroes of Newerth) is now free to play. Let’s Keep DotA Clean – Don’t Cheat!